I saw my first SL10 yesterday at a local CompUSA, and I spent a few minutes playing with the device. It was surprising how short the device was. 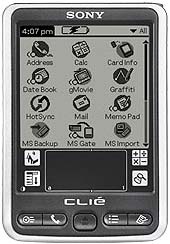 While the screen is slightly smaller than the Clié T615C, all of the remaining vertical space from the T series has been removed, making at about an inch shorter. The thickness of the device was slightly more than the T series, mostly due to the two AAA batteries that power it. The width was the same as a T series, but the shell was plastic, not metal. The stylus is similar to the thin stick used in the T series, and had a metal shaft and black plastic pieces. The metal was similar to the shiny steel used in the Visor styli, rather than the duller metal in the T series styli. The face buttons were all easy to press, with the up/down much better than the version from the T series. The jog wheel and back button worked just like other Sony devices. The power button at the top is very small, placed right next to the Memory Stick slot. Finally, there's the screen. It is hi-res, and when powered off, it stays black, rather than the usual grey. Text was clear and well defined, and I could see several shades of grey. However, the screen has a major problem, in my opinion, and that's switching speed. It seemed to take half a second for a black pixel to turn white again, leading to lots of ghosting for any application that changed its display a lot. I beamed over Montana Solitaire from my Kyocera QCP-6035, and the effect of cards fading off the screen when picked was pretty distracting. I can imagine trying to use this with an autoscrolling ebook reader would be frustrating. I wasn't able to test the backlight on the unit, as the store was too bright to see how it worked. The 320 by 320 screen may help some, but with the fading, I found it harder to read Sony's thin fonts than to read a similar 160 by 160 device. With Palm and Handspring's recent price reductions, there's a lot of choice in the low-end monochrome market. The m105 at $100 beats this device on price and screen quality, while the m500 at $200 wins on styling, and screen quality as well. A Visor Edge, selling for $130, also competes very well. Ben Combee is the Technical Lead for Metrowerks, the maker of CodeWarrior. What up with these guys and the soupy mono-screens? The thin fonts i can live with - font hack and the OS 5 fonts look beautiful on my clie. But the ghosting is an issue. Was the background dark gray like the old 415 model was? Or something closer to the dull white of the old m505's? The first poster, please name any other new device cheaper than this. Better to have 320x320 HiRes. sub_tex, how did you use the OS5 fonts with fonthack on your Clie? I tried but could not get them to work. I'm sure it was me substituting the wrongs fornts. Thanks in advance. who cares if the device is new or not? os 5 is coming out in a few months, so ALL current PDAs will be old. whats the point of having a hi res mono screen that is unusable because of this ghosting effect. i would rather invest 150 bucks on a s360 which has 16 mb of internal ram, an internal rechargable battery, better buttons, and an awsome screen that doesnt 'ghost'. sorry, but this thing isnt worth the money, and it wont sell. With LCD displays, I think there are engineering trade-offs between either or power and ghosting, or contrast and ghosting. I wonder whether the SL10 has a better than average AAA battery life or a slightly higher contrast display than the 415? If this were a model being targeted at older adults, a higher contrast display would be a winning move. But this seems to be a low end model; and the kids would much prefer a handheld suitable for gaming. exactly...you cant play really play games on this thing because of the awful ghosting effect...i mean....what was sony thinking? the thing would sell better with a 160x160 screen...it prolly would have been cheaper too. >buttons, and an awsome screen that doesnt 'ghost'. Base on your statement, apparently you never seen HiRes. Otherwise you will not say you prefer to get S360. Size of RAM does not make that much sense now with Palm OS 4, you can put programs into the card. obviously you have not seen a screen that suffers from ghosting! why the heck do you think the t415 was such a HUGE flop! even after its price was practically cut in half! the unit wont sell. end of discussion. > os 5 is coming out in a few months, so ALL current PDAs will be old. And PalmSource is currently working on OS 6 which will be coming out next year with native ARM application support, so all all os 5 devices are already obsolete. Anyway, Sony usually has no trouble selling models that are only slightly cosmetically different than the previous ones. big difference...an OS 5 pda will be able to upgrade to OS 6... OS 4 and below can not be upgraded. big difference...buying a 2002 model on Jan 1, 2002 vs. buying a 2002 model on Dec, 31 2002. Buing Palm m105 in Febuary 2001 and still buying Palm m105 in August 2002. EIGHTEEN MONTHS for the same model ?????? Get some innovation please, poor Palm. Considering the price, it may just sell regardless if the screen isn't top notch. The T-415 screen was almost 'paper white' if you had strong flourescent lighting from above (like on CompUSA's show room), but indirect lighting simply made the screen a murky mess. Sony should have figured out how to mimic the Edge's screen (really nice). Yes, well ... er, ghosting is very innotative ... I guess. Did you not see where the author said that ghosting is ONLY NECESSARY IF YOU'VE USED A FASTER PDA? Then he went on to say that HE NOTICED GHOSTING ON HIS Vx? Do any of you plan on going from your NR70 to this model? No! All you guys do is jump to conclusions based on what you skimmed, not what you read. I don't see where anyone claimed to have noticed ghosting on their Vx, certainly not the author. All you people screaming GHOSTING GHOSTING. . where are you running to? What do you have to do in such a hurry that the ghosting effect is so disruptive that any sane person shouldn't spend a mere 150 bucks for this. What? are you picking your nose, trynna get a number?. .?? I agree, yes there is ghosting. But compared to the $300, $400, $500, and even $600 palms and CE's out there, this is a fair bargain. . if not wise!! What about us people who have never use a pda before ever? would this devilish 'ghosting' crap get tp us? probobly not. if youre just gonna discourage people like me from buying this pda for a reason that we wont even notice, well.....stop! What a great deal for a Palm OS device. It's got all a new palm user could want and more. My kids are getting them for the back to school rush. Of course they want my 760 so I tell them I want the nr70v and they laugh. There is always something better coming. But I'll take this cute PDA any time. Go back to your Sony cubicle now. You people at Sony have better things to do with your time than anonymously plug the SL10. You can start by fixing those swinging effects in your Spiderman movie. So is it the same screen as the T415? RE: So is it the same screen as the T415? Doesn't sound like it at all to me. The t415's screen was dark, dark, dark. You had to turn the backlight on to use it. The review doesn't say anything about that. Ghosting yes, too dark no. I saw it at Best Buy. The screen reminds me of the T415. Yuck! It's too bad, I had really high hopes for this model...oh well. I played with one at best buy and at compusa yesterday. it's definitely the 425's screen. If anything it looks smaller, but that's proably just an illusion brought about by the smaller casing . I hate to say it, but if it was up to me to spend my money, I'd gladly take an s360, m500, or m125 instead of the SL10 (in that order). Better grab up the last of those 360's while you can! 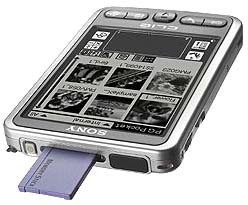 This is probably the worst Sony Palm device release thus far...Heck, the S320 is a far superior unit to the SL10, IMHO! I saw the SL-10 at CompUSA. If the screen isn't exactly like the T415, then it's incredibly close. I was unimpressed with the screen but pretty impressed with the price tag. What irked me about the T415 was the gall that Sony had to charge $300 for that crap. The fact that they're charging half that for the SL-10 is more justified, I think. So are those pictures with or without the backlight? I agree! I mean, first of all, that pic has got to be with the flash directly on the screen. Take a pic of any b and l pda and itll show you that pic is crap you cant take a pic with a reglar flash and expect the sceen not to reflect off it a little- i mean, thats a flash thats like double a head-on flourescent light! its like enough to kill a deer! WHY DONT YOU STOP COMPAINING ABOUT YOUR PDA< TAKE IT BACK AND GET ONE THATS COLOR FOR 100 DOLLARS MORE????????? M105 beats this on screen quality? Then this screen must be terrible. I get a headache staring at my M105 for more than 5 minutes. RE: M105 beats this on screen quality? it's all RELATIVE. Back in the days of the original Pilot your m105 screen would have looked INCREDIBLE!!! And the 2007 screens will blow away today's versions! Why is this so G.D. difficult???? Can't one of Palm's 18+ Chiefs/Vice Presidents figure this out??????????? Wait for 2 more months, and OSLO will give you 2,3 and 4. It's a matter of time to get you 1. Since both Sony & Palm sell memory expansion (SD/Memoty Stick), they have lots of incentives to limit the amount of RAM, so that they can sell more memory expansion cards... so I think 16/32MB RAM will stay for a while before we see an official 64MB RAM Palm OS PDA. 1. I don't want OSLO's moving parts!!! I think this is trouble (see NR70 Broken hinges) and I don't want an extra step of pulling it apart just to enter some data and then have to close it again. I also don't want anything THICKER than my m515. 2. Selling Memory Expansion is all fine and good but without a seamless VFS it's like kissing your sister! Stop throwing a tantrum, and realise that Palm does not make devices for you and you only. They need to make a device that they can sell for a decent price, and make a profit on. They could develop 'your' palm, but how many people in the mass market would buy it?